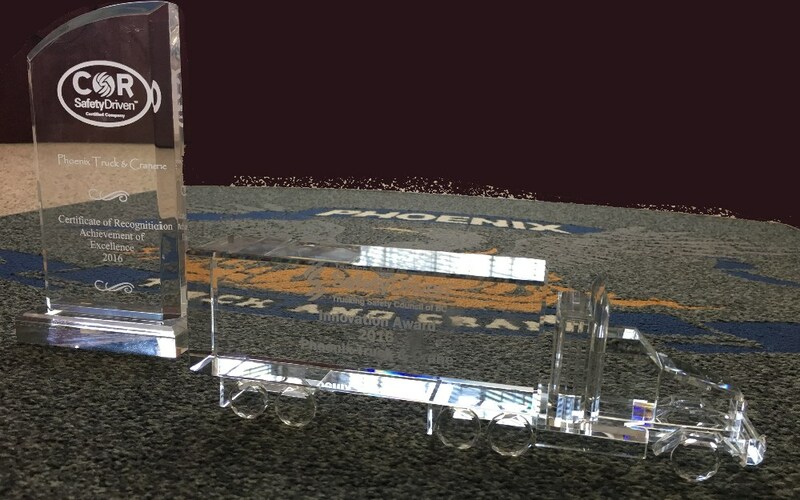 Coquitlam, BC, May 17, 2017 – Last Thursday, Phoenix Truck & Crane was elated to receive two awards; 2016 Large Employer COR Award and 2016 Health & Safety Innovation Award. Since 2010, the Large Employer COR Award recognized employers who have exceed industry standards, changed their safety habits, and continually improved upon their safety records. Phoenix’s achievements in attaining the Certificate of Recognition (COR) and exceeding with Safety Driven’s four main challenges – commitment, communication, implementation, measured review – have earned this year 2016 Large Employer COR Award. The 2016 Health & Safety Innovation Award was presented to Phoenix recognizing their innovation within the existing COR program. This included their commitment to implementing and mandating new safety standards to their drivers, and their fulfillment in training and certifying the fleet of 130 owner operators. The leadership that Phoenix demonstrated throughout the initiative has paid off, as it moves forward and rolls out province wide. Phoenix Truck and Crane is proud to be the first (and only) prime contractor in BC who has taken health & safety to the next level, establishing COR as a company wide policy. With this, Phoenix is pleased to take the helm within the transportation industry. Phoenix certified its entire fleet of 130 owner operators, in just 10 month – a distinctive accomplishment that no other BC transportation company has achieved. Throughout this initiative, Phoenix reduced it work-related incidents by 15 % to distance itself from the industry average of almost 6.5%. Committed and sustainable, Phoenix Truck & Crane believes that continued expansion of the freight industry is strongly connected with making safety a priority. Established in 1991, Phoenix Truck & Crane is the largest same-day delivery company in the Lower Mainland. Offering a fleet of over 150 trucks and cranes of various sizes and capabilities, Phoenix can accommodate any job 24 hours a day, seven days a week. Phoenix services a wide variety of industries all with diverse freight needs. From expedited deliveries of products within the construction industry, to providing crane services to the film industry and large sporting events. Throughout the 26 years in business, Phoenix Truck & Crane’s commitment to providing outstanding service and maintaining a safe and healthy working environment has led to what the company is today; a reliable, professional and reputable local company, which believes in being impactful through community investment.